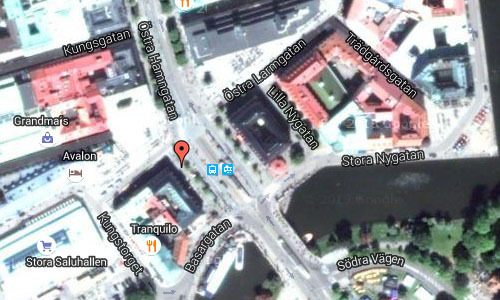 Kungsportsplatsen is a square in the city centre of Gothenburg, Sweden. The square was constructed 1852 and got its name after the King’s Port (the name literally means The King’s Port Place). The gate was the main entrance to the fortified city, which was and still is surrounded by a moat. When the city grew outside the moat and there was no need to defend the city any longer the gate was torn down. 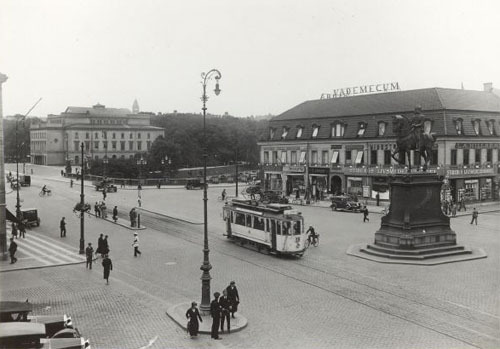 At Kungsportsplatsen there is a statue of king Charles IX, which was placed there 1904. The Volvo in the picture is possibly a P445A from 1950, built by AB Svenska Järnvägsverkstäder (ASJ). These cars were equiped with a ladder-frame. The use of a separate ladder chassis provided Volvo with an easy solution in their desire to produce a suitable commercial vehicle. 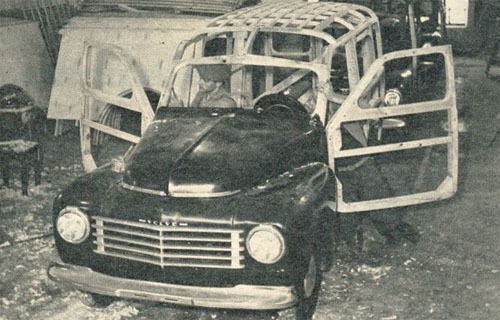 The availability of the bare chassis also allowed Swedish coach builders such as ASJ, Grip, Valbo and Nordbergs to build PV445-based pickup trucks, convertibles and specialized commercial vehicles. Later Volvo introduced their own commercial vehilcle, the Duett. 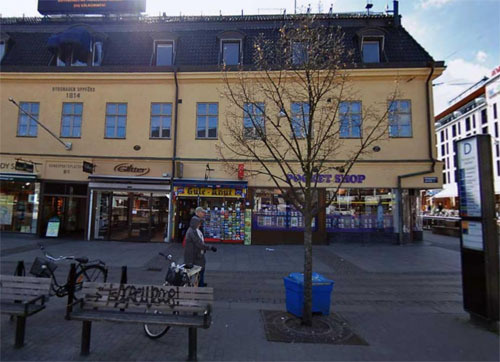 At Kungsportsplatsen 2, the Stibergs livsmedelshandel was located where later Stibergs Renkött shop was located. The company Axel Stiberg & Co. was registered in 1854 by Axle Louis Stiberg. 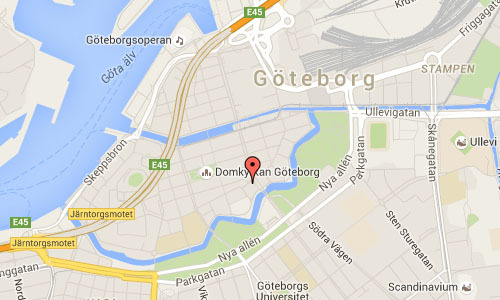 Its initial activities were related to tobacco goods at the Östra Hamngatan 36 in Göteborg. In 1910 they also launched a cigar factory, which became very succesfull and resulted into several large modernly decorated cigar shops. 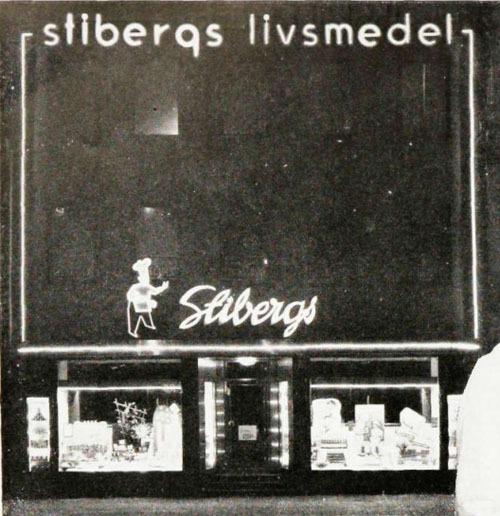 When the tobacco state monopoly in 1914 was introduced, a new business plan was introduced, namely Stibergs Livsmedelshandel (Stibergs Grocerystores), from which some what later in 1919 resulted in Stibergs Konservfabriker with Stibergs Livsmedelshandel at Kungsportsplatsen, Göteborg, as show and sales location. 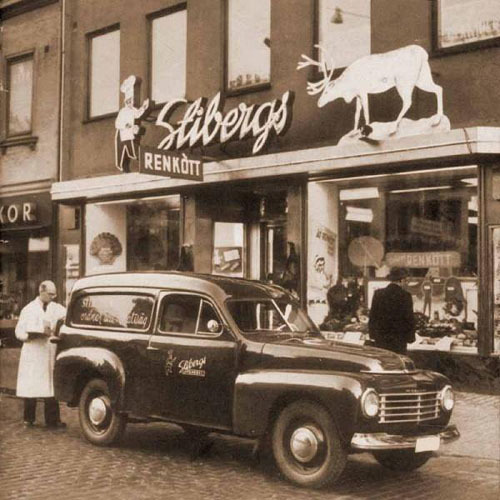 Stibergs Konservfabriker produced all types of fine charcuterie, meat and canned fish, as well as all kinds of delicacy-herring, anchovies, caviar and other products. 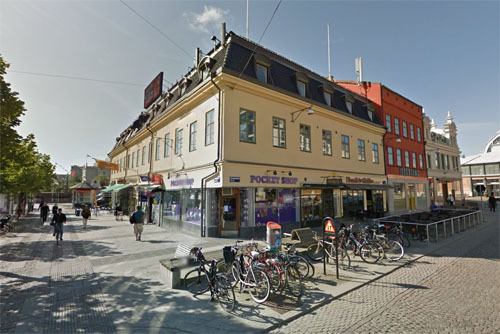 Customers were found in Göteborg and throughout Sweden, later also with significant export business in North America, Australia, England and Denmark. More information at sv.wikipedia.org, www.ica-historien.se/ and www.pvchassi.com.